St. Martin's Griffin, 9781250079091, 352pp. Named One of the 16 Best Young Adult Books of 2016 (So Far) by Paste Magazine! Trixie Watson has two very important goals for senior year: to finally save enough to buy the set of Doctor Who figurines at the local comic books store, and to place third in her class and knock Ben West--and his horrendous new mustache that he spent all summer growing—down to number four. Trixie will do anything to get her name ranked over Ben's, including give up sleep and comic books—well, maybe not comic books—but definitely sleep. After all, the war of Watson v. West is as vicious as the Doctor v. Daleks and Browncoats v. Alliance combined, and it goes all the way back to the infamous monkey bars incident in the first grade. Over a decade later, it's time to declare a champion once and for all. The war is Trixie's for the winning, until her best friend starts dating Ben's best friend and the two are unceremoniously dumped together and told to play nice. Finding common ground is odious and tooth-pullingly-painful, but Trixie and Ben's cautious truce slowly transforms into a fandom-based tentative friendship. When Trixie's best friend gets expelled for cheating and Trixie cries foul play, however, they have to choose who to believe and which side they're on—and they might not pick the same side. 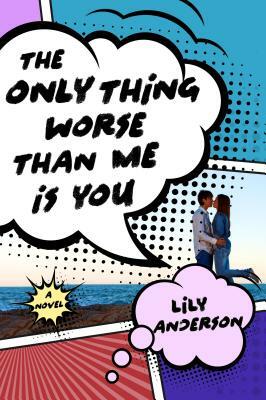 Stephanie Perkins meets 10 Things I hate About You in The Only Thing Worse than Me Is You, a fresh, romantic debut from author Lily Anderson inspired by Much Ado About Nothing. LILY ANDERSON is an elementary school librarian and Melvil Dewey fangirl with an ever-growing collection of musical theater tattoos and Harry Potter ephemera. She lives in Northern California. THE ONLY THING WORSE THAN ME IS YOU is her debut novel.